Heat Reminders and Also, What’s That Smell? Amidst the elephant stampede that is my work life for the time being, I had a momentary realization and went to go check when the summer solstice was happening. Sure enough, it was yesterday. Thank you, Google, for spelling it out. What prompted me to check, if I’m being honest, is that it’s been balls hot this week. I think I’ve alluded to the fact that I’m not a hot weather person. 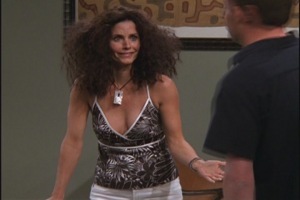 The recent ninety-degree temperatures and my hair’s response to the 400% humidity, not unlike Monica in Barbados, made me wonder if it was the official start of summer just yet. Sure enough, it arrived a day early. I have such a love/hate relationship with summer. On the one hand, I complain that it’s too long and it’s too damn hot. On the other, it goes by SO fast, as it commences unofficially with Memorial Day, followed closely behind by Independence Day, and rounds off with Labor Day. Before we know it, bam! It’s September and it’s Cinnamon/Apple/Pumpkin season, also known as cinnappkin season, and I’m wondering how long it will be before Christmas everything is in my face. Before I get to enjoy delicious cinnapkin treats, I must endure three months of doing everything I can to stay reasonably cool, usually failing miserably (short of being cooped up in an air-conditioned office all day, which then makes me happy to be at work, and then I get all workaholicky). Secondly and perhaps more importantly, summer brings certain odeurs with it that other seasons do not. Namely, the smell of putrid rotting garbage. In the heat, every smell is magnified to an intense degree which is difficult to endure. Being a person who can sniff out the slightest of scents hours after they’ve occurred in an enclosed space, whenever I’m hit in the face with the smell of rotting garbage or sizzling dog poop because it’s a hundred degrees out, I gag and fiercely wish for the swift death of this particular season. There are the nice parts to summer, too, but they are as fleeting for me as seeing a shooting star. It’s rare I get to go on any kind of “summer vacation” at this point in my life, so enjoying a beautiful place with a beach or mountains or doing anything else fun where I could actually enjoy being out of doors is pretty much out of my grasp. Plus, even when I do get to be outside for any length of time when the sun is at its strongest, I’m obsessing about my skin’s exposure to the strong summer sun. And then I get hot, tired, and thirsty really easily. And then I whine. Summer = whining, can’t you tell? While I am grateful this other issue I’m about to mention isn’t as literally in my face as when I lived in the Big Apple, summer also brings with it extra strength B.O. Being a defensive pedestrian (as opposed to being a defensive driver, I guess?) means holding my breath a lot more, especially when walking past certain people (I make snap smell judgments) or if a jogger/biker/greasy-looking-person happens to whizz by me. Or takes a wiz BY me. Okay, probably time for me to find another positive aspect to summer. I DO enjoy the extra hours of daylight. It’s nice to get ready for work in the morning, especially now that I’m an early-morning-schedule person, with the sun shining in and seven a.m. doesn’t feel like three a.m. Same goes for coming home from work and having the lingering light go into the eight o’clock hour. And, if the air is feeling soupy at night and I can’t sleep because I’m feeling too warm, I remind myself that I pay my own electric bill and can choose to go up to my thermostat and crank down the temperature to 65 degrees if I damn well please. So there is that – summertime reminds me I’m not subjected to the thermostat whims of my parents any longer. Win! But really, for the most part, I’m gritting my teeth and waiting for the sweet release of autumn. And cinnappkin everything. Blerg. Three months to go. I may or may not be speaking from current experience. But I’m pretty sure The Big Badass Universe is telling me (or yelling at me?) 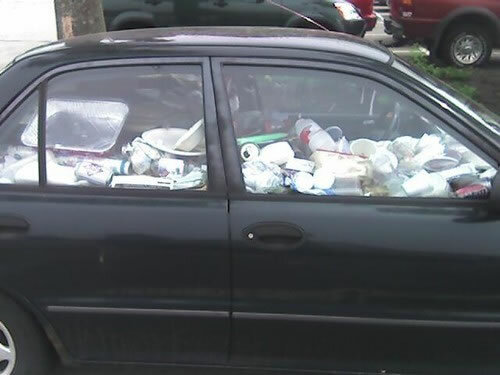 to clean out my car already. Note: I share my car with my other half so even though some of the fault lays at my feet, some of it does not. That is all. Cans clink together every time you turn left or right. You use your backseat as a personal ‘filing’ system for all those important papers. You can find everything BUT the windshield scraper that normally finds a way to annoy you the other 9 months of the year you don’t need it. You have to apologize for “that smell” before anybody rides in your car with you. The dog blanket in the back, covered in fur, makes it look like the Abominable Snowman is homeless and sleeping in your car. You have $23.74 in change in your would-be ashtray. The inside door handles are all filled with candy wrappers (or old keys…). There are ranch dressing packets on the floor, one of which has broken open and spilled onto the floor mat, and you can’t be bothered to clean it up right away. Receipts, separate from “important papers,” fill every available empty space outside the change, wrappers, and used tissues. Birds could make a four-family condominium from the refuse you keep in your Moving Dump. This isn't my car but it FEELS this messy.